READING, Pa. - The Albright football team returns to action on Saturday when it travels to Stevenson for a MAC game at 1 p.m. It's Homecoming weekend for Stevenson, and the game is sold out. 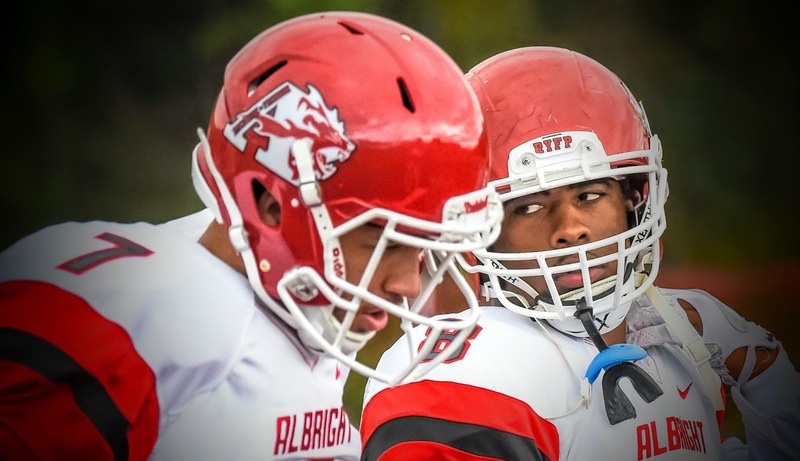 Albright is coming off a bye week after losing its Homecoming game to No. 7 Delaware Valley, 41-6, for the Lions' first loss of the season. Albright entered the game ranked No. 24 in the AFCA poll, but it fell out of the rankings following the loss. Albright is receiving votes in both the AFCA poll and the D3football.com poll. Stevenson enters Saturday's game with a 3-3 overall record and a 3-2 mark in MAC games. Stevenson is 2-0 in home games this season, outscoring opponents 103-16 in those two victories. Last week, Stevenson lost on the road at Lebanon Valley, 31-24. The Mustangs trailed, 31-14, in the fourth quarter before scoring 10 unanswered points to make it a one-score game. Quarterback Dan Williams went 25-for-43 for 238 yards with a touchdown and three interceptions, and Isaiah Austin led the Stevenson rushing attack with 71 yards on 15 attempts. Sebastian Vainqueur led the team with 86 receiving yards and a touchdown on six receptions. Senior defensive end Isaiah Baylor ranks second in the MAC and 31st in the country in sacks, posting 0.92 sacks per game. Baylor is also third in the league in tackles for loss (1.8/game) and forced fumbles (0.33/game). Baylor has helped the Lions' defense to being ranked second in the MAC and 41st in the NCAA in team sacks. Albright averages 2.83 sacks per game. Widener leads the MAC with 3.29 sacks per game. The Albright offense has a balanced attack from its receivers so far in 2017. Four Albright receivers are within five catches of one another with Mike Jordan and Kyle Dickerson leading the team with 29 receptions each. Malik Jackson has 28 catches with a team-high 434 receiving yards, and tight end Milton Cordero has 24 grabs for 286 yards and a touchdown. Jordan leads the team - and the MAC - with six touchdown catches, and Jackson has three. The Lions have won each of its last five games following a bye week. In those five games, Albright has won those games by an average score of 38-10. Last year, the Lions defeated FDU-Florham, 59-7, following its bye week. The Lions' last loss following a bye week came in 2011. Albright lost to Cortland State, 14-0, in the ECAC Southeast Bowl to close the season. Albright currently sits in third place in the MAC, just a half-game behind Widener for second place. Stevenson is tied for fourth with Lebanon Valley for fourth place in the conference with 3-2 records. Lebanon Valley owns the tiebreaker after last week's victory over the Mustangs. Lebanon Valley travels to Misericordia while Wilkes plays at FDU-Florham. The Centennial Conference and the Middle Atlantic Conference (MAC) will continue with its postseason bowl series in 2017 for a third-straight year. The Centennial-MAC Bowl Series will involve the top two teams from each conference that are not selected to the NCAA Division III Championship. The top team from each conference that is not selected to the NCAA Division III Championship will host the second-best team from the opposing conference. The MAC has won all four bowl series games to date. Delaware Valley has picked up two of the victories over Moravian (2015) and Muhlenberg (2016), while Stevenson defeated Muhlenberg in 2015 and Albright defeated Franklin & Marshall in 2016.